"Wild nights - Wild nights! It's so brutal, so funny! Emily Dickinson? Funny? Oh yes! Her poems often have great wit! Why has her narrative been so limiting? This is the problem with being a woman who doesn't conform to the role society deems appropriate for her. This is also the problem with posthumous fame. You're not around to control the narrative. One of the real delights of Madeleine Olnek's "Wild Nights with Emily," with Molly Shannon playing the socalled "belle of Amherst," is how funny it is, fresh and funny and absurd. Olnek takes one of the many Emily Dickinson theories - that the famous "spinster recluse" had a lifelong love affair with Susan Gilbert, her childhood friend and eventual sister-in-law - and runs with it, has fun with it, flings open the doors, letting in light and passion and life. This could have been a dreadfully dreary affair if the approach had been didactic. In Olnek's hands, it's a romp, but it's a romp with real bite. Emily and Susan are first seen as girlhood friends, taking long walks together, talking, experimenting with kissing. Kissing leads to passionate embraces. When Susan suddenly decides to marry Emily's brother Austin, Emily is heartbroken, but Susan reassures her she's doing it for them. It will be perfect. She and Austin will live in the house right next door to the Dickinson family home, and she and Emily can go on as before. This is just what happens. As grown women, Emily and Susan (Susan Ziegler) steal passion when they can, and send hundreds of notes back and forth to one another throughout the day. Austin (Kevin Seal) never suspects, although the children appear to be hip to what's going on. Meanwhile, Emily writes poetry, and so much of it is about Susan, so much of it calls out Sue by name. ("From out the wide night’s numbers - / Sue - forevermore! "), Sue is flattered, impressed. She urges Emily to try to get published. All along the way, Olnek knocks over commonly-held myths about Dickinson, and she does so with gleeful relish. One of the persistent myths is that Dickinson didn't care about getting her work published, that she wandered around scribbling brilliant verse, cringing at the thought of anyone reading it. This is complete rubbish. When editor Thomas Wentworth Higginson (played with amusing condescension by Brett Gelman) put out advice to "young contributors" in the Atlantic Monthly, Dickinson sent him a batch of her poems with a note: “Are you too deeply occupied to say if my verse is alive? The mind is so near itself it cannot see distinctly, and I have none to ask.” This does not sound like a woman who shrank from publicity. Olnek sets up how the rumors got started with an entertaining and effective framing device. Mabel Todd (Amy Seimetz, in a breezily funny performance), the woman responsible for bringing out Dickinson's poems posthumously, gives a lecture to a ladies' group, reiterating that Dickinson was a "spinster-recluse," and only wanted fame if it came after her death. Mabel Todd had ulterior motives, and here is where the story careens into real-life "Real Housewives of Amherst" territory. Todd positioned herself as the expert in all things Emily Dickinson, even though she and the poet had never met. What she failed to mention on the lecture circuit was her long-term and fairly brazen love affair with Emily's brother Austin. As Olnek imagines it, Emily and Sue fall into bed together, while Austin and Mabel grind against one another in the parlor, and it's as plausible as any other theory. When Mabel finally gets her hands on all of Emily's poems, she sets about "correcting" them, editing out Dickinson's signature dashes, smoothing the idiosyncratic punctuation, and - crucially - erasing the name "Sue" wherever it appeared. The "spinster-recluse" narrative started to solidify. While we should be thankful to Todd for working to bring these poems to the public, her handling of them was an act of butchery. 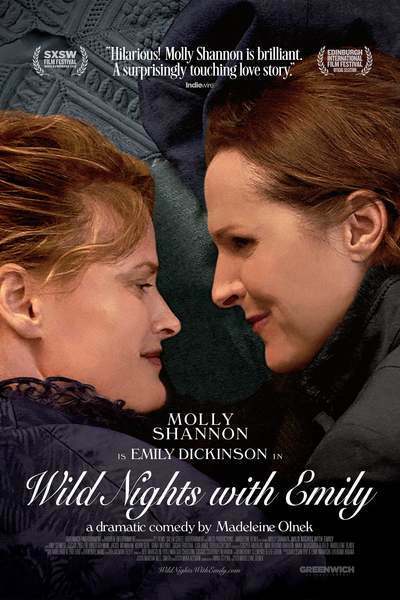 In "Wild Nights with Emily," particularly in the final scene, the term "erasure" - and what that really entails - has never been depicted with such clarity. Terrence Davies' beautiful "A Quiet Passion" focused on the "quiet" part of Emily's life, a life lived in one location, echoing with time being marked off, an expansive inner life, an awareness of mortality (Dickinson was one of the most death-focused of poets). It's difficult for people to imagine, still, why a woman might "opt out" of marriage and motherhood. Olnek's approach is different, and refreshing. This isn't a story of star-crossed lovers or tragic renunciation. It's the story of two women who figure out the best way to keep seeing each other, who madly embrace in the kitchen before running back to their chores. Susan checks in with Emily every day, asking to read whatever she's working on. Matter-of-factly, Emily pulls a batch of poems out of her belt, removes a scrap of paper from her bun, opens her locket to take out a tiny slip of paper hidden inside, handing it all over. She is literally covered in poetry. This is a great example of Olnek's style. It's respectful, but it's also alive. It's serious, but it's also tongue-in-cheek. Olnek's approach gives Emily room to breathe. At last.